It was great to be part of the organizing team of the second Barcamp in Vancouver. 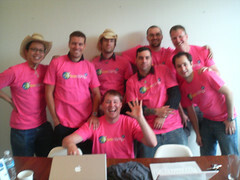 This is a shot of us sporting the “fuschia” shirts! I did a session on open source business development, I am sure someone will write something on it and I’ll cross link. I was under the impression that my topic would not attract many people and 30 minutes would suffice, silly me! Room two was packed and half-hour was a tad too short, it seemed we where just getting started! I enjoyed KK’s photo-walk and I managed to get a bunch of pictures. A special shout to John for his iPhone for Canadians session, maybe the hi-light of my day! Yeah I know; geek! Again, a BIG “THANK YOU” to all our sponsors, without your help, this would be slightly less fun!